Thanks to social media we're more connected than ever. You're never more than a few clicks away from speaking to someone, whether you're out shopping, tucked up in bed or even at the top of Ben Nevis: as long as you're connected to the internet you're conencted to the world. New products are always exciting. Especially ours. But as excited as we get about them, you're who they really benefit. The more we offer, the more you can create and sell to your own customers. So it's worth keeping an eye on things, right? 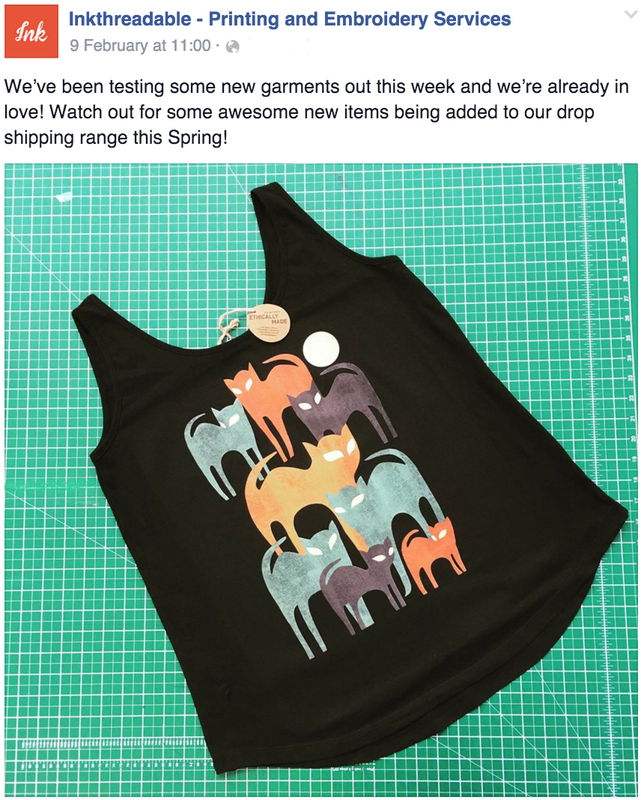 We show off any new products predominently through Facebook, but it's also worth keeping an eye on our other social chanels to see what else we're up to. We periodically refresh our online catalogue with product updates, but from time-to-time we'll add entirely new styles, ranges and even brands that are all available on-demand for your drop shipping business. And the best part is we've personally vetted them all. We don't simply add everything we can to bulk out our catalogue: we print, wear and wash everything we want to offer before we'll make it available for our customers. There's no better way to keep up to date with any changes to our product catalogue than following our social chanels. Bit of a Nosey Nelly? That’s fine, we’re not shy. 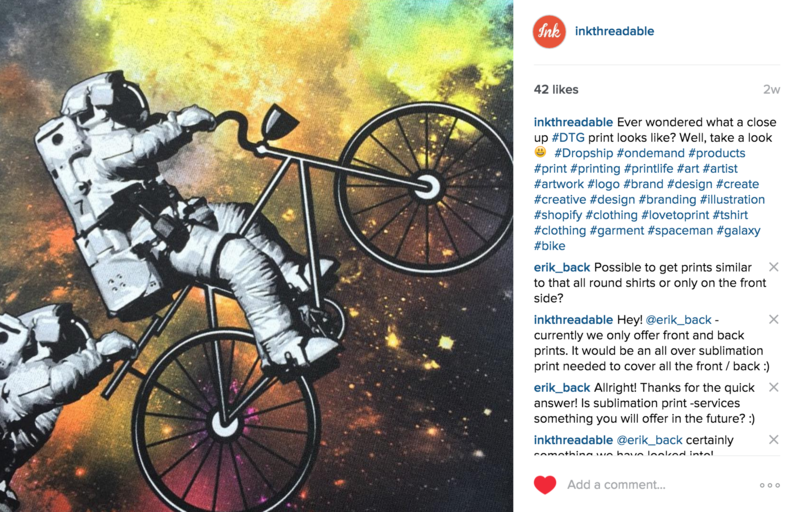 We love showing off what goes on behind the scenes at Inkthre­adable.­ From production videos on YouTube to product photography on Instagram you’ll find something that keeps your curiosity in check. Have you always wondered how we print your DTG t-shirts or embroider your snapbacks? There's romance in mystery, but we'd rather be transparent. Our YouTube chanel has videos detailing the production processes for the things we do to create your products. If photography is more your thing you should be following our Instagram chanel. We print some trulely amazing things for our customers and we love showing off just how good they look. 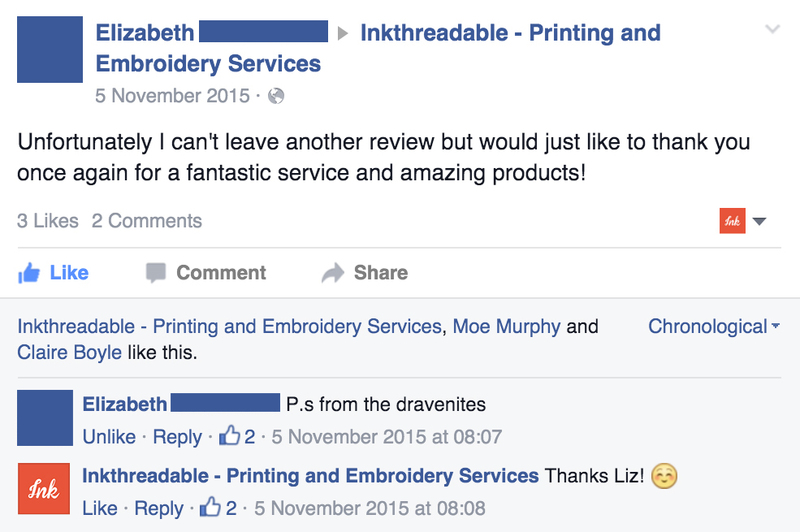 Customer service is important to Inkthre­adable. We believe nothing fosters trust more than a brand that can be contacted easily with a friendly team of advisers ready to help. And be held accountable if problems ever arise. Social media is perfectly suited to customer service. It allows you to speak to our team in no-time through platforms like Facebook or Twitter, whether you're on a phone, tablet or computer. You're welcome to sound off about everything we get right or ask for some help if something has gone wrong. We do our best to respond to all comments, questions and messages and address any concerns accross all channels as quickly as possible. Thanks to social media, if you need any help we're never far away. As an eCommerce brand we can imagine nothing is better than when your supplier rolls out a good deal, and the best part about our offers is that you decide how to use them. Do you use a 10% off deal to sample a range of products you're thinking about adding to your product range? Or do you pass on the discount to your own customers, offering a sale without taking a hit on your profit margins? Our offers are pushed across all social channels, especially Twitter. 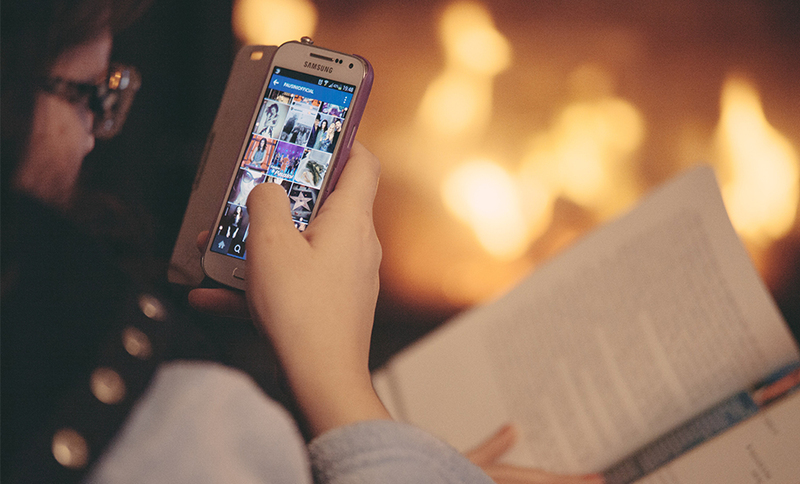 There's no better way to let us know how things are going than through social media. It keeps us accountable. Anything you say to us can be seen by each of our current and potential customers and that's the way we like it. We're always looking for ways to improve our service, but even if you're just really happy with how things are going we'd love to hear it. Facebook and Twitter are by far the easiest ways to give us feedback that's accessible to anyone who's interested. You can also join our mailing list to have emails dropped straight in your inbox. 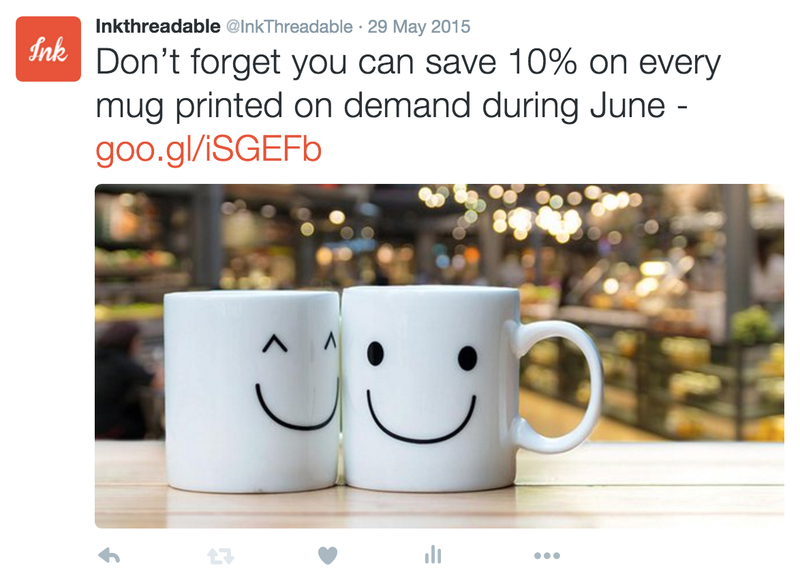 We'll let you know when new products arrive, if we're running any new offers and keep you up to date with any Inkthreadable news.